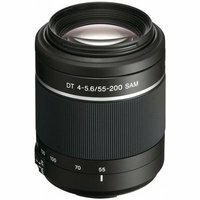 Sony DT 55-200mm f4-5.6 SAM Lens is a medium to telephoto lens with internal focus motor offering 35mm equivalent focal lengths of 82.5-300mm on a Sony Alpha digital SLR. It is both compact and lightweight, making it a useful ''take everywhere'' lens. As one of Sony's DT lenses it has been designed specifically for use with their APS-C sized digital sensors in the Sony Alpha range of cameras. The inclusion of the SAM (Smooth Autofocus Motor) makes for smooth AF operation.